Fengle is a fantastic tangle for fitting other tangles in, out and around. The tangling is getting better and better as the years go on. I am just in love with this. All of us are improving and growing in our creativity. Thank you! This is amazing!!! Love the colored details!!! Oh gosh, I adore Fengle so much already, but now I am seriously in love and will have to try to expand my decorative/embellishment work when I use it! Love, love this so much, and the touches of colour, just awesome! Yaaa! I actually introduce fengle at the end of my intro to zentangle along with onamato and show them ten possibilities of how these two tangles could be used together. It's like a light bulb is switched on. Amazing what they can come up with in the first class using just these two tangles... Now with your example, I'll really show them what can happen with zentangle and creativity plus a huge dose of determination. Thank you again and again and again! Oh Angela you are very welcome! This looks great. I don't think I usually make my Fengle large enough to put other tangles inside it. Have a card that I am working on and may have to try this. Love how this flows across the page. Beautiful, Shelly! I love putting tangles inside and all around tangles too. Fengle is wonderful for this! oh my gosh!!! i've been wanting to try something like this. but it wouldn't look this awesome. just sayin'. beautiful!!! This is just beautiful! Thanks for opening my eyes to yet another possibility! So lovely! Absolutely STUNNING! I do love this elegant piece of art! 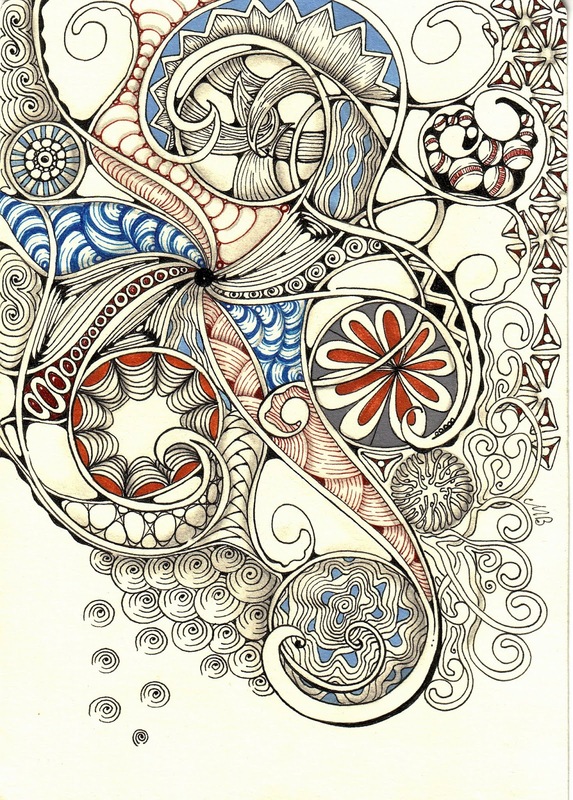 I just stumbled upon your artwork, in fact I am rather a novice at tangling, but yours look just so effortless! Beautiful too! Looks like fengle is going to be my next "best friend" ! Whoa!! This took my breath away!! I will not rest until I am that good!! Thank you.